Congratulations! We service your area. If your zip code does not pull up on our website, please call us to confirm we service your area. We offer affordable pricing plans ranging from one-time cleanings and monthly cleanings, to bi-monthly cleanings and quarterly cleanings. Your dirty trash can is a petri dish for bacterial growth, and cleaning it yourself is inefficient and environmentally hazardous. Sign up today to say goodbye to your smelly, unhealthy trash cans! Your trash can is the dirtiest place in your home. Dirty cans promote bacteria growth which can make you and your family sick. Don’t let your trash can stink up your garage and serve as a breeding ground for harmful germs. The Clean Can Company offers sanitation services for trash cans. We will keep your can free of foul smelling odors and harmful bacteria. Your can will look more aesthetically pleasing, and you won’t fear the smell of your garage or the side of your house anymore. Our cleaning methods employ 3500 psi, 200°F, and 0 degree angle washers that are environmentally friendly and use less water than if you were to do it yourself. 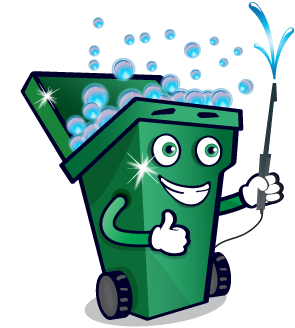 We offer discounted rates for Homeowner Associations needing their entire neighborhood’s cans cleaned.